Climate Risk-Informed Decision Analysis, or CRIDA, is a methodology that aims to provide water resources planning guidance for decision making under uncertainty, particularly climate uncertainty. It is the result of a collaborative effort from ICIWaRM, The Alliance for Global Water Adaptation (AGWA), Deltares, UNESCO-IHP, the University of Massachusetts, and the World Bank. The goal of the CRIDA method is to combine existing bottom-up approaches such as decision scaling, developed by the University of Massachusetts Amherst, and adaptation pathways, developed by Deltares, in order to tailor a traditional planning process to the water resources problem at hand. At each step, CRIDA provides the practitioner with recommendations regarding when and how to deviate from traditional planning. 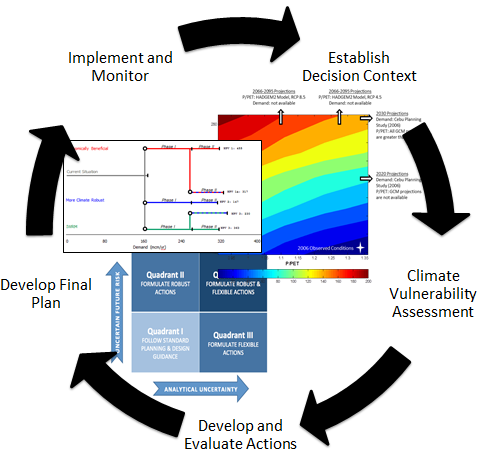 For example, based on an initial vulnerability assessment of the system to climate metrics of interest, the practitioner uses CRIDA guidance to select the most applicable strategic direction ranging from traditional alternatives to more flexible or robust strategies. These factors also influence the recommended economic evaluation methods and implementation requirements for the final plan. 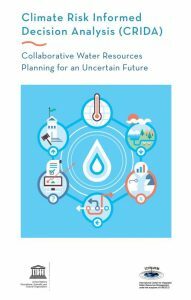 In the end, the practitioner has developed a water resources plan that accounts for uncertainties and consequences in the system via a method that can be easily communicated to stakeholders and decision makers. A CRIDA guidance manual was co-published by ICIWaRM and UNESCO in late 2018. CRIDA is built into UNESCO-IHP’s project on Enhancing Climate Services for Improved Water Management (CliMWaR). A community of practice is currently being developed through international workshops and conferences and the approach itself is being vetted through international pilot projects, located in Thailand, Eastern Europe, Mexico, Chile, Vietnam, Zambia, the Philippines, and elsewhere, in collaboration with the World Bank, Stockholm International Water Institute (SIWI), USAID, United Nations Economic Commission for Europe (UNECE), the Organization for Security and Cooperation in Europe (OSCE), and the US Department of State. For more information, contact Guillermo Mendoza.